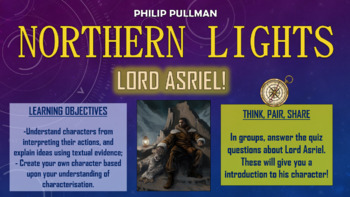 Northern Lights (The Golden Compass) - Lord Asriel! 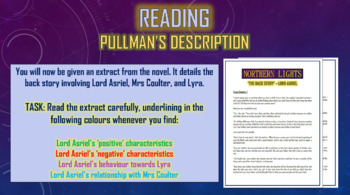 This engaging and informative lesson enables students to understand the key features of effective anti-heroes, as characterised by Lord Asriel in Philip Pullman’s Northern Lights. 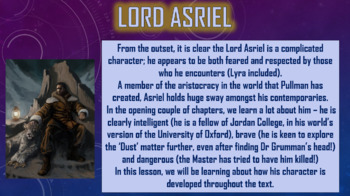 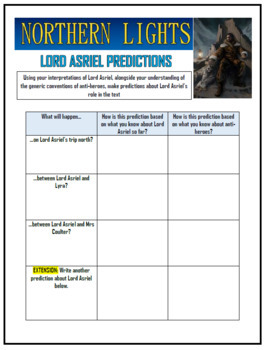 In particular, students interpret key character traits of Lord Asriel evident in the 7th chapter of the text, before utilising this understanding to make predictions about the later events involving Lord Asriel, and then creating and describing their own anti-heroes.